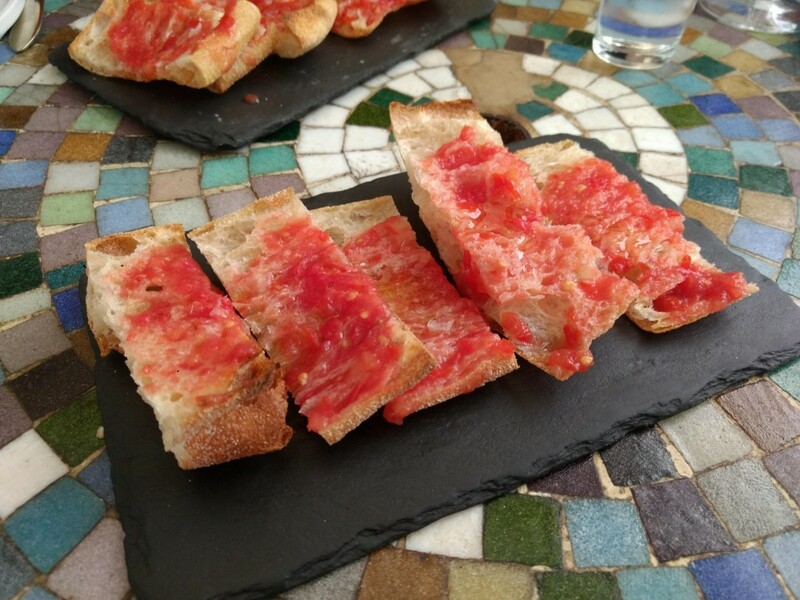 Share the post "“Barcelona, Love at First Taste” with Eye on Food Tours"
Bring together delicious food, a unique and interesting history, and the beauty of Barcelona, and you’ve got yourself a winner! I had the pleasure of going on a morning foodie walking tour recently with Eye on Food Tours, where we explored the historic neighborhoods (and restaurants) of El Born and Barceloneta. It was 4 hours of pure fun and foodie heaven! No time to read it now? Click above and pin it for later! I’ve been living in Barcelona for 3 years now, but I learned so much on this tour. There is so much to see and do here, that I feel like I will still be wandering around this city with childlike wonder for years to come. 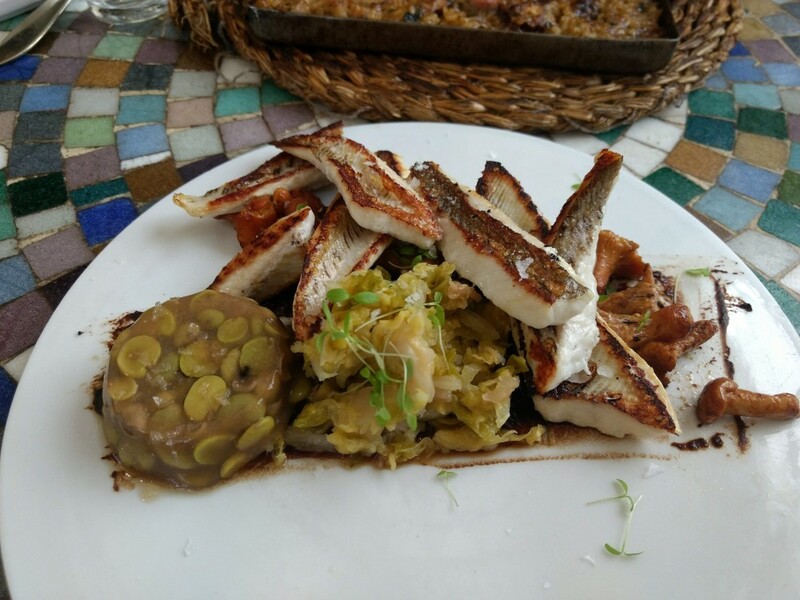 I highly recommend anyone who is visiting Barcelona to check out this tour – get an idea of the city, its rich history, and a taste of some high-quality food, and you won’t be soon to forget it! Eye on Food Tours offers various tour options, and they are expanding all the time. The morning tour, which is what I had the opportunity to experience, is called Barcelona, Love at First Taste! They also offer an evening tapas tour, called Sips, Sites & Bites. If you prefer something more customized, they offer personalizable VIP tours. Barcelona, Love at First Taste! We met our guide, Adrian, in front of a metro station in the center of Barcelona. We began by meandering along what is remaining of the old, Roman wall in the Gothic Quarter and he explained the history behind the humble beginnings of Barcelona. I’ve never been much for history, but his explanations really helped give me an idea of what it was like back then. He also gave us visuals to show how Barcelona has changed from then until now. I’m generally the first person to tune out during speeches about history, but something about his story-telling ability had me asking for more. Did you know, for example, that Columbus came to Barcelona to meet with King Ferdinand after his voyage to the Americas? After that bit, it was time for a snack – it is a foodie tour, after all! Adrian led us through the charming streets of the El Born neighborhood, pointing out cute, locally-owned shops along the way. We found ourselves in front of a Catalan bakery, with an interesting history that dates back to before the dictatorship of Francisco Franco. 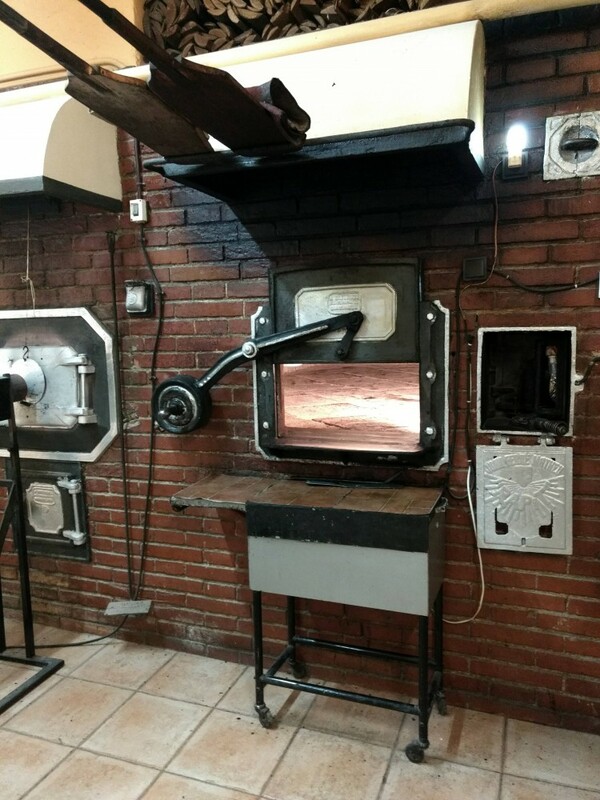 Inside, we were greeted by the friendly shop owners, who ushered us into the back kitchens where we got a peek at the gigantic oven where they bake their specialties fresh every day. 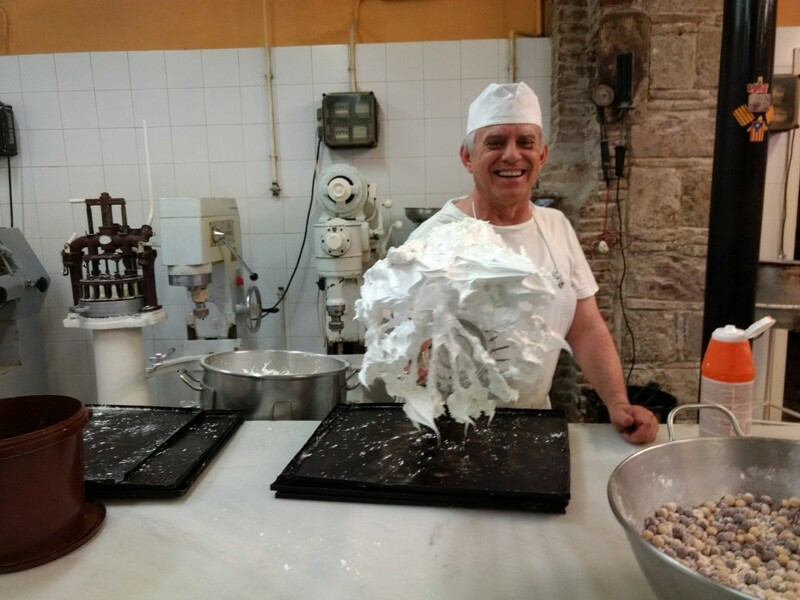 The cooks were incredibly friendly and eager to give us a taste of the Meringue that they had just whipped up! It was super delicious, with an amazing fluffy texture. 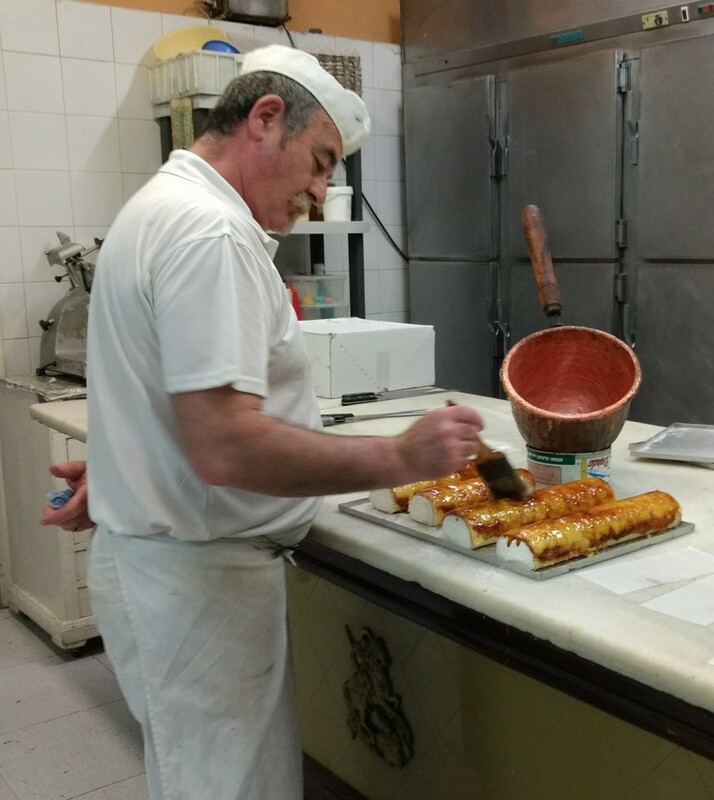 After that, we went back into the main part of the cafe and sipped on some café con leche while our guide, Adrian, explained to us the history behind the Xuixo, a typical Catalan pastry. Surprisingly, I had never tried nor heard of it before, but it was fantastic! Perfectly crispy on the outside and filled with an amazing, homemade cream filling. After licking our fingers clean, we headed to the beautiful Santa Caterina market. This market is both visually pleasing (due to its unique architecture) and a fantastic way to get a taste of authentic and local Catalan cuisine. Locals come here every few days (some even come every day!) to get their hands on the freshest and highest-quality produce and meats. Our guide, Adrian, bringing us some fantastic local olives! Local cured meats – yum! Here, we got to taste 3 different types of cheese from all over Spain. Adrian explained to us the process behind each one, along with the ingredients and wine pairing suggestions. From there, we were handed a giant cone full of a variety of gorgeous and juicy olives. Each type had been perfected with marinade recipes handed down from generation to generation. My favorites were the giant Manzanilla olives! 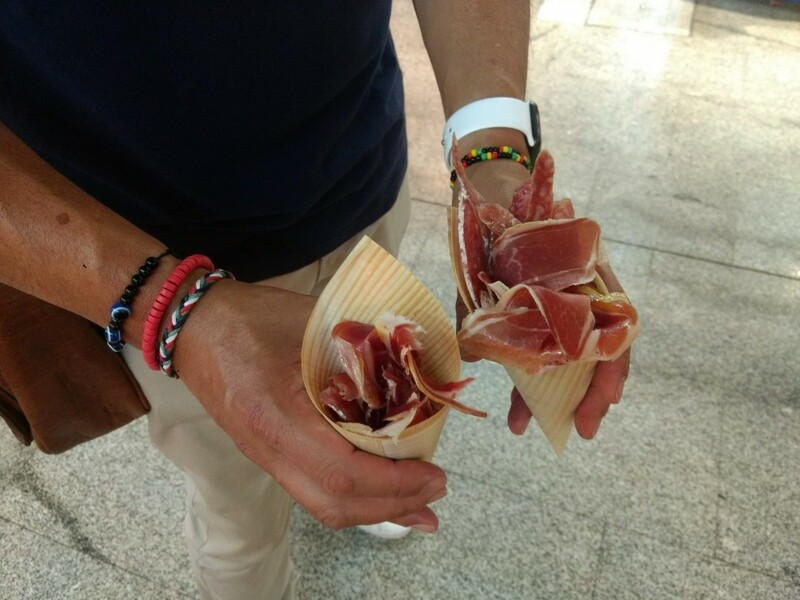 And, of course, you can’t leave a Catalan market without trying the jamón! We tried jamón ibérico, jamón serrano, longaniza, and also learned the difference between the three. I am a sucker for the cured meats here, so I thoroughly enjoyed this part! From there, we were off to Barceloneta, an old fishing village converted into a trendy neighborhood bordering the beach and port of Barcelona. Adrian guided us to a street that didn’t look like anything special, and then directly into a crowded tapas bar that didn’t even have a sign out front. How much more authentic and local can you get? We squeezed our way up to the bar as Adrian explained to us the basic method of making sparkling wine and Catalan cava. 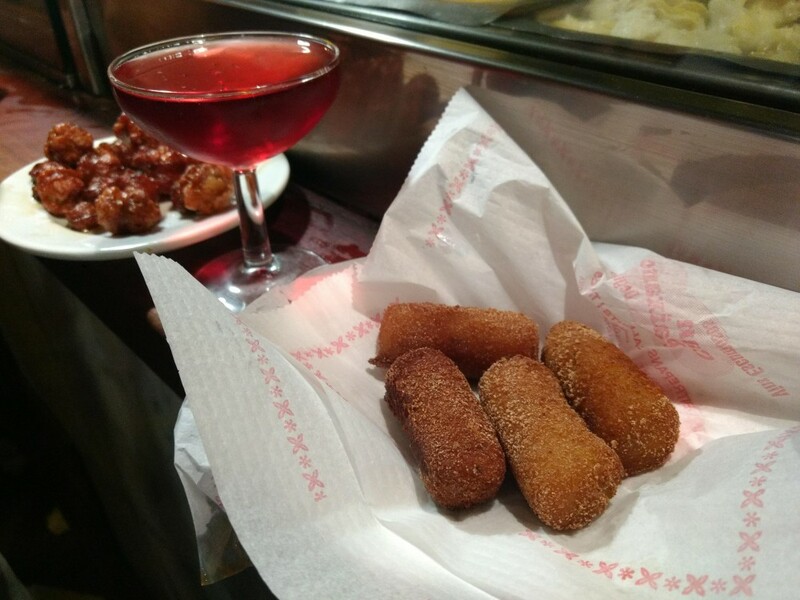 First, we tried a delicious and slightly sweet rosé sparkling wine, paired with croquetas de jamón and chistorra (a delectable, slightly spicy sausage, cooked to perfection). We then washed it all down with a refreshing glass of Cava! A perfect combination that delighted the taste buds. 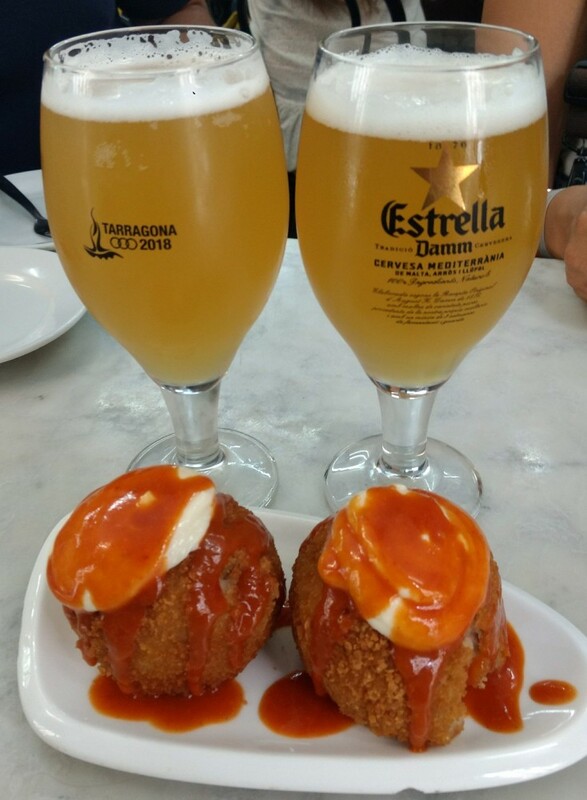 We headed further into the center of the Barceloneta neighborhood, and Adrian explained to us the history of the “Bomba,” a typical and popular tapa invented in the very same neighborhood. We entered a bar and got to try a taste of the Bomba for ourselves, and cooled ourselves off with a Clara (mix of beer and lemonade, super refreshing, especially in the summertime heat!). Time passes by so quickly when you’re having fun, doesn’t it? Before we knew it, we were headed to our last stop, a charming little restaurant owned by a friendly local couple. 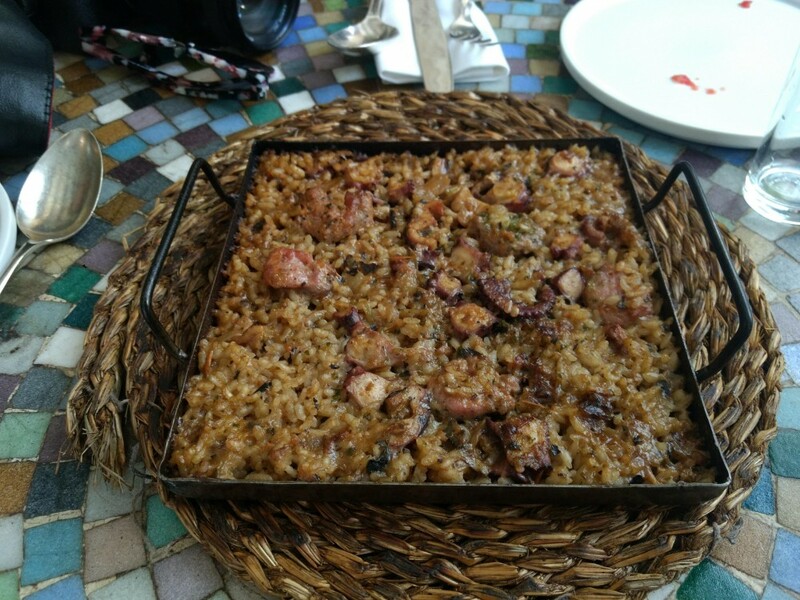 They offered us some white wine and served us arroz con pulpo y butifarra (rice with octopus and sausage) and their fish of the day, in this case a “spider” fish (which I’d never heard of prior) that was out of this world! We sat there, enjoying each other’s company like old friends. Adrian is such a friendly an open person, and I learned so much about the history and local food of Barcelona through him! When we had finished our last bites, we were quite satisfied – I couldn’t imagine eating anything else, it was the perfect amount of food and drink! 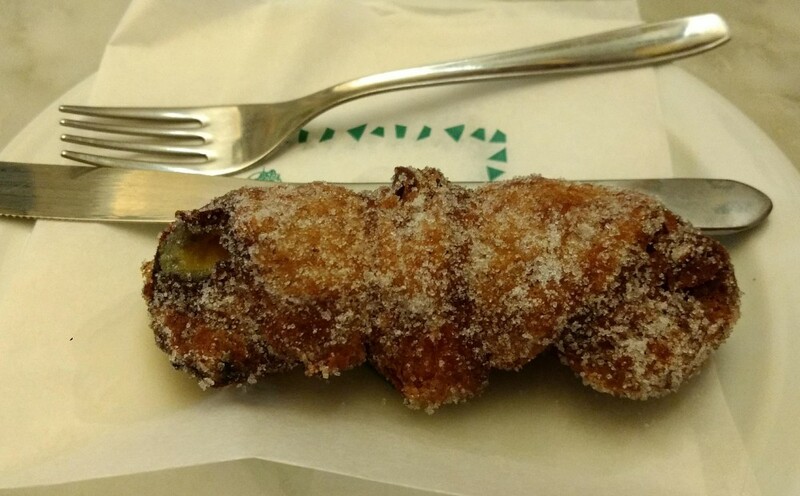 If you’re visiting Barcelona, whether it is your first time or your 50th, I would highly recommend checking out this foodie walking tour! It has a little something for everyone, and you’re sure to learn something new. For more information on the company and the various tours they offer, check out their website. Click above to pin it for later! Thanks for sharing your thoughts on this! My mouth started watering when you mentioned the olives! We’re going to Barcelona in November, so I’ll have to see if this tour is available during our dates!! 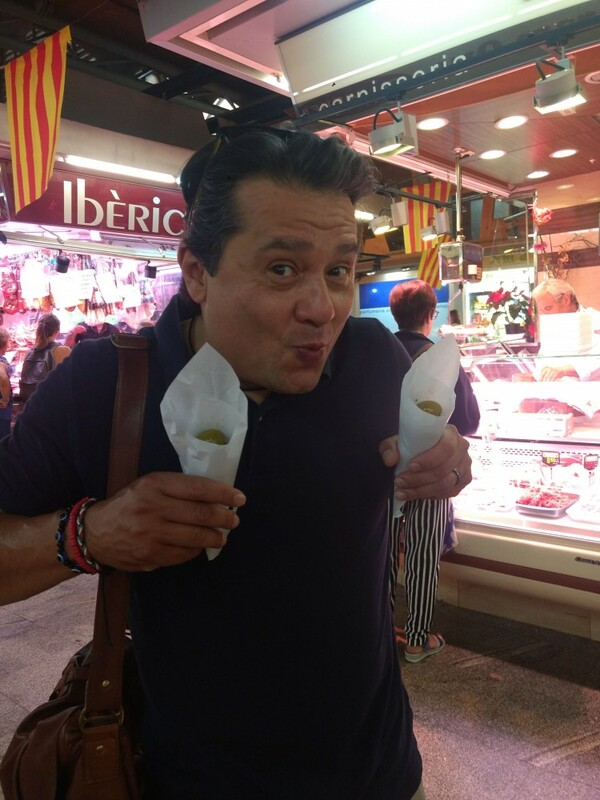 I would love to do this food tour in Barcelona. The food all looks so good and it’s nice to learn about the history. Thanks for sharing on #TheWeeklyPostcard. Food tours are fun anywhere and give you more insights about a destination than you might think along with delicious dishes to try. I myself am not the biggest fan of olives but of course in places like Spain I would give it a go. Can’t go wrong with food, can you? It was a great experience, you’d definitely enjoy it! 🙂 Thanks for reading! Mmmm your post is delicious! We really need to start doing some food tours! We’ve never done one bc we never make the time! Barcelona seems like a good place to get started! Thanks for linking up with #TheWeeklyPostcard! Thanks, the key to my heart is definitely through my stomach haha. It was delicious! You’ll have to come visit and try it 🙂 Thanks for reading!